I am grateful for the e-mail that I received on Wednesday morning at 12:06 a.m. See, as those of you who have read my blog know, I just graduated from law school. During the summer I took the NY bar. On Wednesday I found out that I had PASSED the NY bar. YES! I have been clinging to that happy feeling for three days (since the rest of my life seems to want to go to sideways). 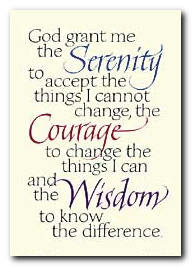 I have been repeating this prayer to myself for about a week now. It has become my mantra. I just wish I could put it to better use.